Are you looking forward to clearing UPSC exams this year? Our vast collection of UPSC general studies books are the best preparation materials for those preparing for UPSC exams - IAS, IES, CAPF, IFS etc. Covering every important chapter of general studies, these books are designed as per the latest and revised syllabus of UPSC exams. 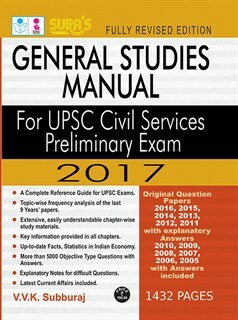 Our UPSC prelims general studies books have well written chapters on general knowledge, general science and technology, Indian polity and economy, history, geography and so on. In addition to this, our books have previous years solved papers and various practice exercises. A subtle base in general knowledge is extremely crucial to qualify in UPSC civil service exams and for the career ahead. Not upto the mark for UPSC, contents are very brief. But useful for state services and other exams. Only plus point is 12yr solved papers. The author has given a great work by sorting out all the difficult questions. And, for these questions, a better description and explanation are given. Excellent!! I find the 2013 edition of this book written by the same author is priced Rs 600, and you have quoted the same for the 2014 too. In that way, I`d say the pricing is reasonable, and in no way exorbitant. Over 8 years question papers are provided with descriptive answers. In other sites, I find books separately for paper 1 and paper 2. What are they? Do you have anything of that kind? Is there discount of any sort?